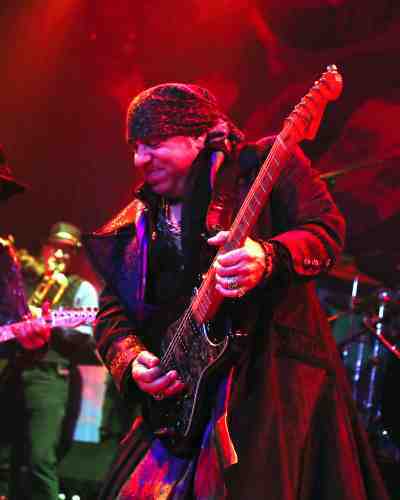 For an entire generation of music fans, Steven Van Zandt, was the bandana loving guitar player from the E Street Band highlighted in Bruce Springsteen's "Glory Days" video. Most viewers, at the time, were not aware that he had two decades of performing, writing, arranging and producing under his belt. Despite all of his behind-the-scenes heroics, it was his solo career in the eighties as Little Steven that intoxicated me. Watching Bon Jovi host their own video block where they aired the "Out of the Darkness" a fan was born. Finding Voice of America was no easy feat but when I did the semi-truck guitar attack that opens the album setting the tone that this was a man who was not afraid of anyone or anything and went for broke. I learned about forced disappearance, apartheid, the dangers of American foreign policy and about a world that terrified me. These were heady topics in a pre-Wikipedia era and I cannot stress how eye opening these albums were for a city kid trying to make his way into the world. Politics aside, the album was a guiding force that never left my side but hearing songs from it live was something I had given up years ago and the fact I was standing ten feet from Steve Van Zandt in Chicago's House of Blues is something I could not have anticipated or expected. His return to the concert stage as a solo artist is something that is long overdue. So how has he ended up here after five decades in the music business? 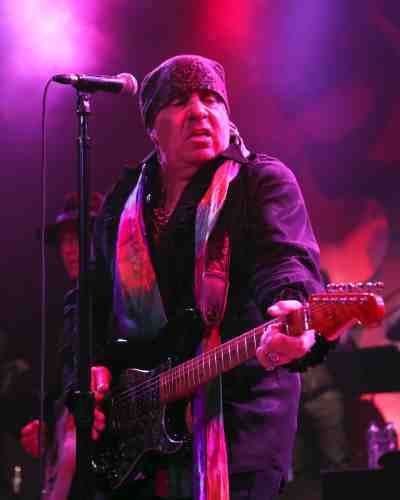 Steven Van Zandt made a name for himself in bar bands on the Jersey shore in the early seventies before becoming the lead arranger, songwriter and producer for Southside Johnny and the Asbury Jukes. Ahead of their debut album came out, he received a call from his old bar band friend Bruce Springsteen, who persuaded him into the studio to arrange "Tenth Avenue Freeze Out" for his Born To Run album before becoming a permanent member of the E Street Band. For six years between 1975 and 1981, Springsteen and the E Street Band were at the peak of their powers on the concert stage, leaving both fan and band exhausted every night with a 3-hour-plus set list, when other acts of the time struggled to fill 90-minutes. E Street Band concerts became the thing of legend and lore, "Did you see the Springsteen show last week? I heard he played five hours and then went to a bar afterwards and played another three hours!" In 1982, the E Street Band setup shop in the Record Plant in New York City to record what would become Born in the U.S.A. a monolith of a record that would smash records across the globe and secure Springsteen's legacy for all time. However, after a burst of recording in early 1982, Van Zandt left the E Street Band and would not return for seventeen years. The yearning to project his voice took precedence where he was reborn as Little Steven. His first solo album, Men Without Women expanded on the template his solidified with Southside Johnny and the Asbury Jukes with big roaring soul songs revved up with a heavy dose of rhythm and blues. Thirty-five years later, more than half of the album would appear in his solo set list. The remainder of the eighties found him tackling politics, most notably on his Sun City for Artists United Against Apartheid. Voice of America, Freedom - No Compromise, Revolution and the late nineties Born Again Savage found Van Zandt confronting world horrors amidst a Godzilla-sized riffs. 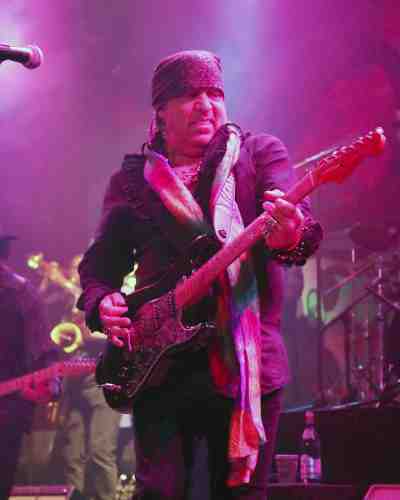 For most of the nineties Little Steven Van Zandt was in hibernation, occasionally emerging to remind the world of his reedy vocals, powerful musical arrangements and no-nonsense production skills. For the last two decades, he's become a household name due to his television roles on The Sopranos and Lily hammer. On top of all of this, he began the Underground Garage Sirius XM radio station where he educates and promotes his listeners with the best garage rock music of the last sixty years. All of this activity has kept him from releasing solo album and touring, until now. Released this past spring, Soulfire is a transcendent record that isn't consumed with four-minute radio hits but deeply personal music steeped in unembellished splendour that will shake, rattle and roll your soul. For a man past the halfway mark of his life, Van Zandt writes and sings as if it is still in front of him. When he began his Underground Radio show, it appeared any and all hope for a solo tour was quashed as the only time he had when not acting or touring as part of the E Street Band would be eaten up by giving rock n' roll a voice on the radio. Make no mistake, his presence has had an incredible impact with many tuning into channel 21 on Sirius XM specifically for carefully curated lists of music that enlighten and educate the average music fan. Opening his set with the Tom Petty cover "Even the Losers", I was caught off-guard by how emotional it made me. People like Springsteen, Van Zandt and Petty came of age where they absorbed every ounce of music they heard. They were there and witnessed first-hand how the world changed and in turn, embodied that spirit for the next generation. These men and their radio shows have highlighted how they had their own language few others could decipher. We may appreciate and admire the music they grew up on, but they witnessed the revolution of rock n' roll and the evolution of the Beatles and the Rolling Stones. They took what they learned, found their own voices and electrified the world with their own brand of musical magic. This is precisely what Little Steven and the Disciples of Soul are expressing each night of this tour. Shows like this do not exist anymore for simple economic reasons. Unless you are an arena or stadium band, there is no room to bring a band this big out with you on the road. Fortunately, Van Zandt has Citibank promoting the tour and it is allowing him to make this vision a reality. The most remarkable aspect of the set and the fourteen member Disciples of Soul is how well they melded with one another covering Van Zandt's eclectic catalog. At least one song from every solo album made the set. "Lyin' in a Bed of Fire", "Inside of Me" and "Soulfire" were drenched in the DNA of rock n' roll. Despite having seen him as Springsteen's right hand man dozens of times the last few decades, this was a full-on rock and soul extravaganza. During "Blues Is My Business", you sat back and watched in awe as Van Zandt shredded his Les Paul guitar while the rest of the band lifted us with a larger than life song. The fifteen musicians elevated every song to new heights. Considering how eclectic and varied Van Zandt's discography is, this is a high compliment. On "Love on the Wrong Side of Town", the horn section and backing vocalists congealed into a dream. "Until the Good Is Gone" captured all the dimensions of his arranging skills and gave him a chance to show how great he is with a six-string guitar. He pushed and pulled with the audience in a "yeah" call and response. During "St. Valentine's Day", I thought back to the David Chase movie Not Fade Away, which Van Zandt helped score with rock music from the sixties. I could not shake the image of James Gandolfini's face where he cannot reconcile what his son has become, but there is love there even if he does not know how to express it. What artists like Springsteen, Petty and Van Zandt did was tear down walls and create a generation of women and men not afraid to express what they feel. In books on Springsteen and Petty, we learn about the hardened men their fathers became who ruled their sons with an iron fist, but rock n' roll released them and made them free and their music did the same for the next generation. "Solidarity" and "Bitter Fruit" pushed the band that featured expanded percussion while on "Ride the Night Away" the band employed all their strengths into a massive mouth gaping display of top tier musicianship. This song was buried at the end of Southside Johnny's Better Days album in 1991, but in concert, it's one of the highpoints demonstrating the gift and force of the band. When I first heard "Angels Eyes" and "Princess of Little Italy", they were on headphones but in concert, they are revelatory canvasses. The Disciples of Soul performed every song in its full-blown glory with broad, muscular brush strokes tinted with spirituality. Little Steven could have done an acoustic tour for this record, but it wouldn't of had the same impact. The arrangements with the fifteen-member band evoke a sense of drama. It's clear with Soulfire that Van Zandt still has a voice yearning to be heard, but what this solo show did was bring the arc of his career into crystal clear focus. The twenty-two song pushed soul, blues, politics, garage rock, world music and good old time fashioned rock n' roll to the forefront. For 140-minutes, he tore through his broad and deeply diverse catalog stretching across five decades. The performance was a joy to behold, especially when you watched this powerful and merciless band of musicians embody these songs. Before performing "Out of the Darkness" Van Zandt took a moment and told the crowd, "we are entering a dark time at the moment...stick together and love each other" and with that, the band went into overdrive on his most redeeming and soulful tune. His hands gripped the microphone stand in rapt attention and reached for the crowd with his lyrics that enveloped the crowd into an exhilarating finale. "Out of the Darkness" was a song I always looked to at times when life steered me down avenues that appeared darkest. The earnestness and optimistic drive of the performance always elevated me as it did when it closed the show. Albums like Voice of America opened worlds for me when I needed them. It carried me in times of need and its influence will live on with my daughter, who I am not ruling with an iron fist, but with whom I encourage to be bold, courageous and not afraid to speak up. I want her to absorb and interpret art in her own way so she has the tools to find her way out of the darkness.